Review: Cal continues to fight for his life in July, the 7th book in the Conspiracy 365 series. Cal has been on the run ever since he was wrongfully accused of attempted murder in January. He is on a quest to understand the Ormond Singularity before December 31st! He was warned in January that it is up to him to finish what his father started before his mysterious illness that took his life leading to the series of events that seem almost certain to claim Cal’s life as well. Cal has managed to life half of the year on the run, ever so slowly getting closer to an understanding of the Ormond Singularity, but can he make it another six? July begins with Cal struggling for his life in a fish net. With a great deal of luck on his side, Cal is brought up on deck with the fish, and although the police are nearby, he is able to hide from them once again. The captain on the ship does not intend to let Cal off the hook easily though. In exchange for hiding him, Cal is indebted to him and expected to shovel fish as pay for the captain. Aboard the ship, he realizes that he is not among friends. After another narrow escape, Cal sets of on his journey to uncover more information about Piers Ormond’s will from his great-aunt Millicent. But, like everything else in Cal’s life, visiting his aunt turns out for more than he’s bargained for. Is he going to put yet another relative at risk? Will Cal be able to make sense of the riddles before the thugs catch him? Race to July to find out what the world has in store for Cal. Once again, Gabrielle Lord has written an excellent mystery. The Conspiracy 365 books are filled with suspense on every page. Readers find themselves holding their breaths as they forge through the pages! Although it is fairly hard to believe that the Australian police would be so incapable of capturing Cal, there is still a hint of believability keeping the readers entrapped. Readers are forever questioning Cal’s loyalties – wondering if the next person that offers to help him is really friend or foe. Cal gets into one of the most frightening predicaments to date in July. The thugs want him dead by his birthday (July 31st), and by the end of the book, it seems as though they’ve finally succeeded. Will they need to really turn to the police – his biggest threat – to save him? August can’t come soon enough! We would like to thank Kane Miller for providing a copy of Conspiracy 365: July for this review. 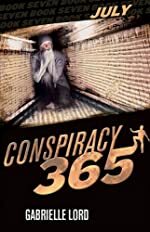 Have you read Conspiracy 365: July? How would you rate it?